We are the Manufacturer of All Types of Foldable steel Pallets , warehouse Pallets , collapsible Pallets , Wiremesh Pallets ,Die Storage Racks , Industrial TRolleys , Platform Trolleys , Assembly Tables , Die Transfer Trolleys , Material Handling Trolleys , Mezzanine Floors , Fifo Racks , Pallet Racks , & All types of Industriual Material handling Products . We are committed in offering our clients an advanced range of Wire Mesh Trolley that is manufactured from superior quality materials and are widely used to carry loads in diverse industrial applications. These are reckoned by our domestic clients owing to their dimensional accuracy, high mechanical strength, rugged construction and durable finish standards. Our entire product range is manufactured using quality assured raw components and advanced technologies thereby delivering exceptional range of Material Handling Trolleys to our clients. we are manufacturer of Metal Box pallets , Industrial Trolley , wiremesh Box Containers , material Handling Handling Trolleys , Belt conveyors , Steel pallets , pallets , racks , Pocket Type Trolleys , Assembly Tables , Al. Profile Tables , Powder coated Tables , Mezzanine Floors , PEB Structures & All Types Industrial Material Handling Industrial Itrems . 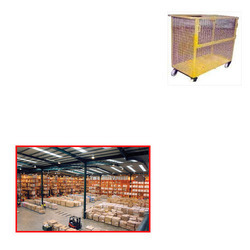 Looking for Wire Mesh Trolley for Warehouses ?